Sorry, I haven't tasted many of these, but last year I wrote about this event afterwards, and that doesn't do anyone any good. On the bright side, my two favorite pinks from last year are back, highlighted below. They may taste differently after an extra year of bottle age. 2010 Regis Bouvier Marsannay, Burgundy (Pinot Noir): A highlight last year, a delicate wine that delivers full Burgundy character with a lighter body. 2010 Abbatucci Ajaccio, Corsica (Sciacarellu): Another highlight from last year, this was an exotic, strongly flavored wine with dried meat, herb and dried orange peel notes. 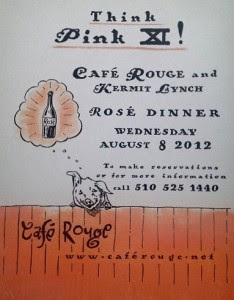 Reservations are still available at Open Table.